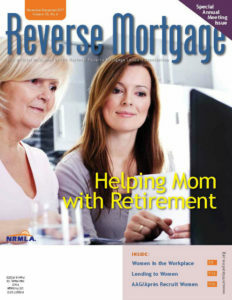 This year’s Annual Meeting issue is devoted to women in retirement. If women talk to each other differently than they talk to men or than we talk to each other, what does that mean for explaining reverse mortgages? Our product is, after all, an intimate one: it can require a discussion of personal finances, expectations, hopes, fears, needs. This is not like buying tonight’s dinner or a new cell phone. We thought it might be of value to our industry to look at borrowing from the point of view of women who, by choice or by events, are forced to make the decisions alone. What are their needs? What do they need to hear? Who will they turn to for advice? And how is this process different from lending to a man alone or a couple?